Lunæ, 29 die Martii; Anno 11 Georgii IV ti Regis, 1830. Accounts, presented: Increase and Diminution of Salaries. Land and Assessed Taxes. No. 206. Petition against Clifton Bridge Bill. Petition in favour of Dundee Harbour Bill. Petitions in favour of Shoreham Bridge Bill. Petition respecting North Level Drainage and Navigation Bill. Petition against Manchester Improvement Bill. Leonard Stanley Inclosure Bill, committed. New Ross (Wexford) Market Bill, put off. Petitions against Burning Widows in India. Petitions against throwing open Beer Trade. Petition for remission of Duty on Beer. Account to be printed. No. 208. Report on County Hospitals, &c. (Ireland) referred to a Committee. Petition complaining of the distressed State of the Shipping Interest. Petition for extension of Poor Laws to Ireland. Ardwick Green and Wilmslow Road Bill. Sheffield and Wakefield Road Bill. Brunswick Square (Brighton) Improvement Bill. The Lords have passed Marriages Validity Bill. Letter on Colonial Income and Expenditure, to be printed. No. 212. Accounts of Hemp, Flax and Linens, ordered. Half Pay to Naval Officers. Account and Estimate of Civil Contingencies, referred. Consideration of King's Message, deferred. Leases of Lands (Ireland) Bill, reported and re-committed. Accounts, &c. presented: Canada Water Communication. No. 209. Petitions against Shoreham Bridge Bill. The House being informed that Mr. Crafer, from the Treasury, attended at the door, he was called in; and at the bar presented to the House, pursuant to the directions of several Acts of Parliament,-Accounts of every increase and diminution which has taken place, within the year 1829, in the number of Persons employed in all Public Officers or Departments, or in the Salaries, Emoluments, Allowances and Expenses which may have taken place, or been paid, granted, received or incurred, for and in respect to all Offices and Persons belonging to, or employed in or by, or in the service of, all Public Offices or Departments, specifying the amount and nature thereof. An Account of the total annual amount of the several Superannuation Allowances granted subsequently to the 5th July 1822, under the provisions of the Act 3 Geo. 4, c. 113, in the Public Departments of the United Kingdom, which remained payable on the 5th January 1829; the annual amount which ceased in the course of the year ended the 5th January 1830; the annual amount which was granted in the course of the year ended 5th January 1830, and the total amount remaining payable on the 5th January 1830. Mr. Crafer also presented to the House, pursuant to their Orders,-An Account of the total number of Gallons of Proof Spirits of the manufacture of the United Kingdom that paid Duty, and the amount thereof for Home Consumption in each Kingdom;-also, the total number of Gallons of Proof Rum, Brandy, Geneva, and all other Foreign Spirits, that paid Duty in each Kingdom; the number of Gallons of each kind, and Duty thereon for each Kingdom;-also, the total number of Gallons of Spirits of all kinds that paid Duty, and total amount thereof, in each Kingdom, and total number of Gallons, and total Duty thereon, in the whole United Kingdom, in each year, from 5th January 1825 to 5th January 1830. Return to an Order of the House, dated the 26th day of February last, for an Account of the gross amount of Land and Assessed Taxes received by each of the Receivers General of Taxes in England and Wales, and by the Collectors of Taxes in Scotland, in the year ended 5th January 1830; stating the amount paid by them for Militia and other purposes, and the net amount paid into the Exchequer by each of the said Receivers General, or remitted by the said Collectors in Scotland to the Receiver General at Edinburgh, within the same period; specifying at what number of days the payments were made from each into the Exchequer, or remitted to the Receiver General for Scotland, so far as the said Order concerns England and Wales. An Account of the amount of Duty on Coals received in Ireland, in each of the last ten years:-And then he withdrew. Ordered, That the said Accounts do lie upon the Table; and that the three last be printed. A Petition of James Acland, Printer and Householder within the city of Bristol, was presented, and read; taking notice of the Bill for building a Bridge over the River Avon, from Clifton, in the county of Gloucester, to the opposite side of the River, in the County of Somerset, and for making convenient Roads and Approaches to communicate therewith; and praying, That the same may not pass into a law. A Bill for more effectually repairing and improving the Road from Wendover to the Town of Buckingham, in the County of Buckingham, was read a second time; and committed to the Marquis of Chandos, &c.: And they are to meet this Afternoon, in the Speaker's Chamber. The Marquis of Chandos reported from the Committee on the Bill for inclosing Lands in the Parish of Haddenham, in the County of Bucks; That the Standing Orders relative to Bills of Inclosure, had been complied with; and that they had examined the allegations of the Bill, and found the same to be true; and that the Parties concerned had given their consent to the Bill, to the satisfaction of the Committee; and that they had gone through the Bill, and made several Amendments thereunto; and the Amendments were read, and agreed to by the House. A Petition of Alexander Martin, William Nicoll, and others, Ship-owners, residing in Dundee, was presented; and read; taking notice of the Bill for more effectually maintaining the Ferries and Passages across the River Tay, in the Counties of Fife and Forfar; and praying, That the same may not pass into a law as it now stands. A Petition of Alexander Christie, Preses of a Special Meeting of the General Commissioners appointed under an Act for the better paving, lighting, watching and cleansing the Burgh of Dundee, and for building a Bridewell there, was presented, and read; taking notice of the Bill for more effectually maintaining, improving and extending the Harbour of Dundee, in the County of Forfar; and praying, That the same may pass into a law. Mr. Astell reported from the Committee on the Bill to continue an Act of the fifth year of His present Majesty, for enabling the Commissioners acting in execution of an Agreement made between the East India Company and the private Creditors of the late Rajah of Tanjore, the better to carry the same into effect; That they had examined the allegations of the Bill, and found the same to be true; and had gone through the Bill, and made several Amendments thereunto; and the Amendments were read, and agreed to by the House. A Petition of Inhabitants of the town and borough of New Shoreham;-and, of Worthing,-were presented, and read; taking notice of the Bill for more effectually repairing and improving the Road from Brighton to Shoreham, for building a Bridge over the River Adur at New Shoreham, and for making a Road to Lancing, and a Branch Road thereupon, all in the county of Sussex; and praying, That the same may pass into a law. A Petition of Licentiate Apothecaries of the town and county of Carlow, was presented, and read; setting forth, That in consequence of the many frauds practised on His Majesty's subjects in Ireland, and the ignorance and unskilfulness of persons pretending to the art and mystery of an Apothecary, to the imminent hazard of the lives of His Majesty's subjects, the Legislature was graciously pleased, in the year 1791, to pass an Act of Parliament for the prevention of such abuses, and for the better regulation of the profession of an Apothecary; by which Act a Corporate Body was established in the city of Dublin for said purposes, by the name of the Governor and Company of Apothecaries Hall, consisting of a Governor, a Deputy Governor, thirteen Directors, and a number of Subscribers, not to exceed sixty; and that the said Governor and Company have given notice of their intention to seek an Amendment of this their Act of Incorporation during the present Session of Parliament; that the Petitioners conceive the said Governor and Company to be unworthy of the confidence of the Legislature, and of having the regulation of the Profession intrusted into their hands, they having perverted the Act of Parliament under which they derive their powers into an instrument of venality and corruption; stating the particulars of their case; and praying, That the House will take into consideration the Apothecaries Act of 1791, with a view to its repeal, so far as the Profession of Ireland generally is concerned, so as to deprive the Company of Apothecaries Hall of powers which they have neglected or abused; that they will be pleased to summon persons to give evidence of the maladministration of the said Company, whose names the Secretaries of the Petitioners, if called on, will supply; that they will graciously please to create an Institution from the general body of the Profession, to be called "The Royal Irish College of Pharmacy," to which the regulative powers of Apothecaries Hall may be transferred; that Examiners, and other officers of authority, may be elected, not on account of their being able to pay some hundred pounds, as at present, but on account of their talents and professional knowledge; that the said College of Pharmacy may have the power of making bye-laws for the regulation of the Profession, under the usual restrictions, and that they may be granted such privileges as have been hitherto conferred upon similar institutions; and, finally, the Petitioners humbly pray, that they be no longer subject to the misrule of a Trading Company, consisting of but twenty-nine practising Apothecaries, in whose election or proceedings they have no voice, whose interest is perfectly opposed to theirs, and who will neither allow others, nor make any effort themselves, to benefit the Public or rescue the Profession from the degradation which their conduct has brought upon it. Mr. Thomas Wood reported from the Committee on the Bill for more effectually repairing and improving several Roads in the Counties of Brecon, Radnor and Glamorgan, and for making and maintaining several new Branches of Road to communicate therewith; and to whom the Petition of the Reverend John Williams, of Abercumby, in the county of Brecon, was referred; That the Standing Orders relative to Turnpike Bills, had been complied with, pursuant to the leave granted by the House on the 26th day of this instant March; and that they had considered the said Petition; and had examined the allegations of the Bill, and found the same to be true; and had gone through the Bill, and made several Amendments thereunto; and the Amendments were read, and agreed to by the House. Mr. Thomas Wood, by Order reported from the Committee on the Bill for more effectually maintaining and repairing several Roads from Carmarthen to Lampeterpontstephen, so far as relates to the Carmarthen District of Roads, and certain other Roads in the said County of Carmarthen; That the Standing Orders relative to Turnpike Bills, had been complied with; and that they had examined the allegations of the Bill, and found the same to be true; and had gone through the Bill, and made several Amendments thereunto; and the Amendments were read, and agreed to by the House. 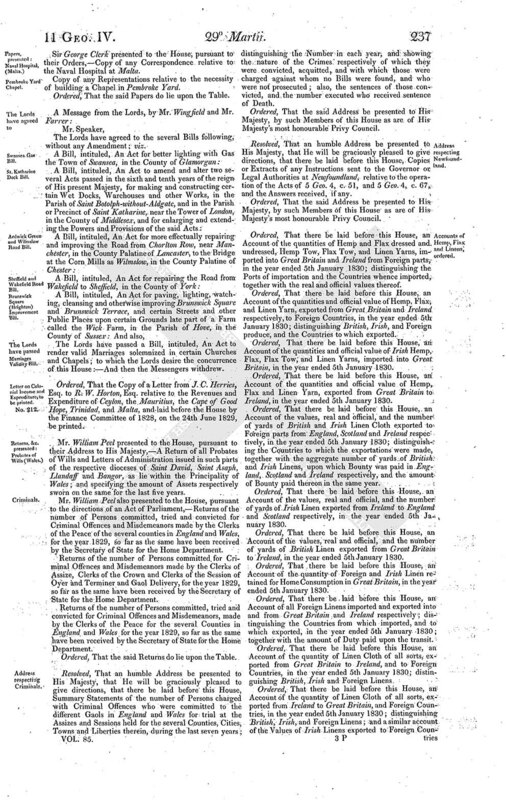 A Petition of Steed Girdlestone and Alexander Mundell, agents of Proprietors of lands in the North Level and Great Portsand, part of the Great Level of the fens called Bedford Level, Promoters of the North Level Drainage and Navigation Bill, was presented, and read; taking notice of the Bill for improving the Drainage of the Lands lying in the North Level part of the Great Level, of Fens called Bedford Level, and in Great Portsand, in the Manor of Crowland, and for providing a Navigation between Clow's Cross and the Nene Outfall Cut; and setting forth, That the Committee to whom the said Bill was referred, upon examining into the allegations thereof, were attended by Joseph Hannath, a proprietor, through whose grounds the main drain proposed by the Bill was intended to be carried, who admitted that he had made no objection to the line, as proposed, until the 17th day of November last; but he informed the Committee that it would come very near to his dwelling-house, and stated the consequences of the operation to be of a description which induced the Committee to desire that another line should be adopted, and they have adjourned until the 28th day of April next, to give time for this purpose; that the Petitioners, yielding to the wishes of the Committee in this respect, humbly pray special leave of the House to deposit, as soon as conveniently may be, a Map or Plan and Sections, showing the line or situation of the said main drain, as the same may be altered, and the lands in or through which the same shall be intended to be made, together with a Book of Reference, containing a List of the Owners, or reputed Owners, of such lands respectively, to whom application may also be made, and that the Petitioners may also have leave, before the said Committee shall again take the said Bill into further consideration, to deposit a duplicate of such Map or Plan and Section at the Private Bill Office of the House, together with an estimate of the expense, and that the Petitioners may also have leave to deposit another Copy of the Bill, with a Map annexed thereto, with the parish clerks of the several parishes or places from, in or through and into which such altered main drain is intended to be carried, ten days at least before the Committee on the said Bill shall again take the same into consideration, and that seven days notice may be given once in some newspaper of the said counties, and that a copy of such notice may be affixed on the church-door of each of the said parishes or places, that such Bill, with a Map annexed thereto, will be deposited as aforesaid, or that the House will be pleased to do otherwise in the premises as to them may seem meet. Ordered, That the said Petition be referred to a Committee:-And it is referred to Sir James Graham, &c.: And they are to meet To-morrow, in the Speaker's Chamber; and have Power to send for persons papers and records. 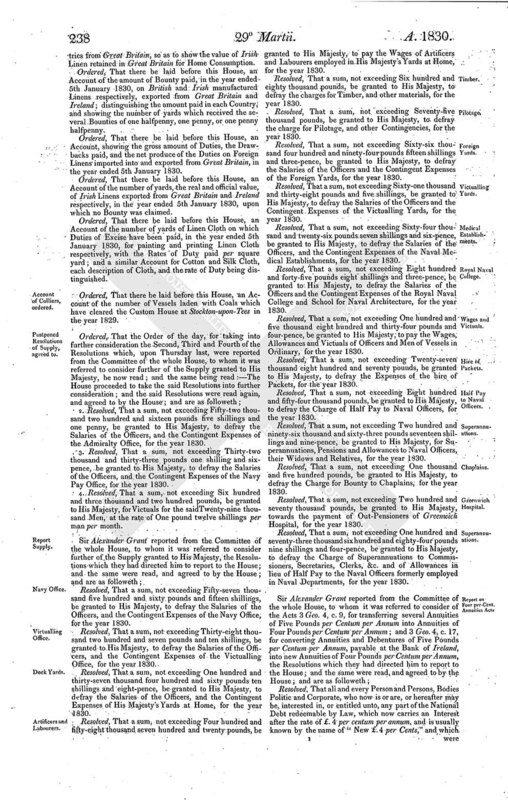 A Petition of Robert Maxwell, of Maxwelton-place, Glasgow, was presented, and read; taking notice of the Bill for making and maintaining a Railway from the Lands of Polloc and Govan to the River Clyde, at the Harbour of Broomielaw, in the County of Lanark, with a Branch to communicate therefrom; and praying, That the same may not pass into a law. 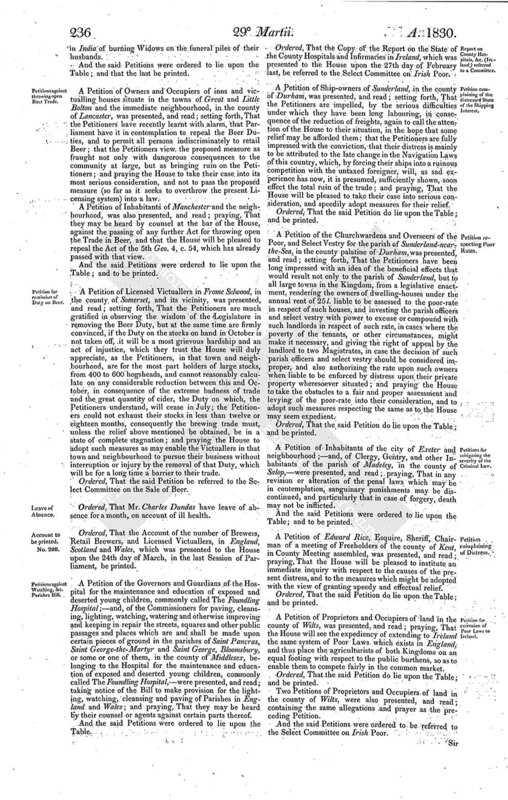 A Petition of Payers of Police Rate in Manchester, was presented, and read; taking notice of the Bill to amend several Acts for supplying the Town of Manchester with Gas, and for regulating and improving the same Town; and praying, That they may be heard by themselves or their counsel against the same. A Bill for inclosing Lands in the Tithings of Arle and Arlestone otherwise Arlstone, in the Parish of Cheltenham, in the County of Gloucester, and for discharging from Tithes, Lands in the said Tithings, was read a second time; and committed to Sir William Guise, &c.: And they are to meet this Afternoon, in the Speaker's Chamber. A Bill for inclosing Lands in the Parishes of Stanley Saint Leonard's otherwise Leonard Stanley, and Eastington, or one of them, in the County of Gloucester, and for discharging from Tithes, Lands in the said Parish of Stanley Saint Leonard's otherwise Leonard Stanley, was read a second time; and committed to Sir William Guise, &c.: And they are to meet this Afternoon, in the Speaker's Chamber. The Amendments following were proposed to be made to the Question; viz. to leave out the word "now," and at the end of the Question to add the words "upon this day six months." And the Question being put, That the word "now" stand part of the Question; it passed in the Negative. And the Question being put, That the words "upon this day six months" be added at the end of the Question; it was resolved in the Affirmative. A Petition of Inhabitants of the parishes of Whitechurch and Garrocloyne, in the county of Cork, was presented, and read; reciting the Act 7 Geo. 4, c. 29, to amend the law of Ireland respecting the Assignment and Sub-letting of Lands and Tenements in Ireland; and praying the House to repeal the same. A Petition of Inhabitants of Haslingden, in the county of Lancaster;-of the clothing district of Yeadon;-of Ossett;-of Farnley, in the county of York;-of the Mayor, Aldermen, Sheriffs and Common Council of the city of Gloucester, in Common Council assembled;-of Inhabitants of the clothing district of Dewsbury, in the county of York;-of Harrington, in the county of Cumberland;-and, of the Chamber of Commerce and Manufactures for Forfarshire, and of the Directors thereof,-were presented, and read; praying, That the trade to the East Indies and China be opened and left free and unfettered to individual enterprize and exertion; and that the East India Company's Charter, conferring exclusive privileges, be not renewed. A Petition of Members of the Church and Congregation assembling for divine worship in Dearden-gate Chapel, Haslingden, in the county of Lancaster, and other Inhabitants of that town and neighbourhood;-of Members of the Church and Congregation assembling for divine worship in Town Meadows Chapel, Rochdale;-in the Independent Chapel, Rochdale;-in High-street Chapel, and other friends of religious liberty, in Lancaster;-in Bethesda-street Chapel, Burnley;-in the Independent Chapel, Bretherton;-in the township of Horwich, Lancashire;-in the Chapel at Church Town, North Meol's, Lancashire;-of the Congregation of Wesleyan Methodists assembling in Clayton-street Chapel, Blackburn;- of Members of the Church and Congregation assembling in the Baptist Chapel, Blackburn;-of Females of the town of Blackburn;-of Members of the Church and Congregation assembling for divine worship in Lower Chapel, Darwen;-in Elenezer Chapel, Over Darwen;-in the Independent Chapel, Chapel-street, Blackburn;-in Mount-street Chapel, Blackburn;-in the Independent Chapel, Southport, Lancashire-in Cockspur-street Chapel, Liverpool; -of Female Members and Friends of the Baptist Church and Congregation meeting for divine worship in Cockspurstreet Chapel, Liverpool;-of Members of the Church and Congregation assembling for divine worship in Byromstreet Chapel, Liverpool;-in Hanover Chapel, Mill-street, Toxteth Park, Liverpool;-in Bedford-street Chapel; Liverpool;-in the Baptist Chapel, Great Cross Hallstreet, Liverpool;-in Great George-street Chapel, Liverpool;-in Murray-street Chapel, Liverpool;-in Limestreet Chapel, Liverpool;-and, of Members of the Church and Congregation of Welsh Independents assembling for divine worship in Great Crosshall-street Chapel, Liverpool,-were presented, and read; praying the House to adopt such further measures as may effectually secure the abolition of the practice in India of burning widows on the funeral piles of their husbands. A Petition of Members and Friends of the Congregation of Protestant Dissenters assembling for divine worship in the Calvinistic Baptist Meeting House at Kettering, in the county of Northampton;-and, of the Female Members and Friends of the Congregation of Protestant Dissenters assembling for divine worship in the Calvinistic Baptist Meeting-House, Kettering,-were also presented, and read; praying the House to adopt such further measures as may effectually secure the abolition of the practice in India of burning Widows on the funeral piles of their husbands. 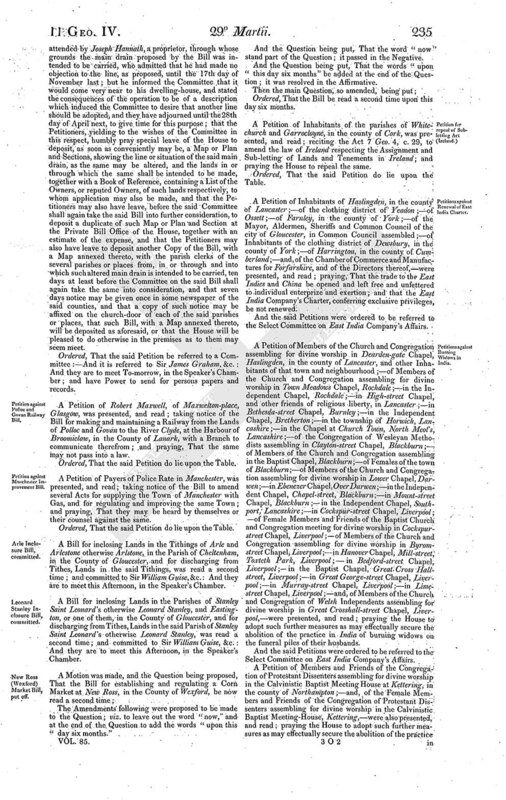 A Petition of Owners and Occupiers of inns and victualling houses situate in the towns of Great and Little Bolton and the immediate neighbourhood, in the county of Lancaster, was presented, and read; setting forth, That the Petitioners have recently learnt with alarm, that Parliament have it in contemplation to repeal the Beer Duties, and to permit all persons indiscriminately to retail Beer; that the Petitioners view. the proposed measure as fraught not only with dangerous consequences to the community at large, but as bringing ruin on the Petitioners; and praying the House to take their case into its most serious consideration, and not to pass the proposed measure (so far as it seeks to overthrow the present Licensing system) into a law. 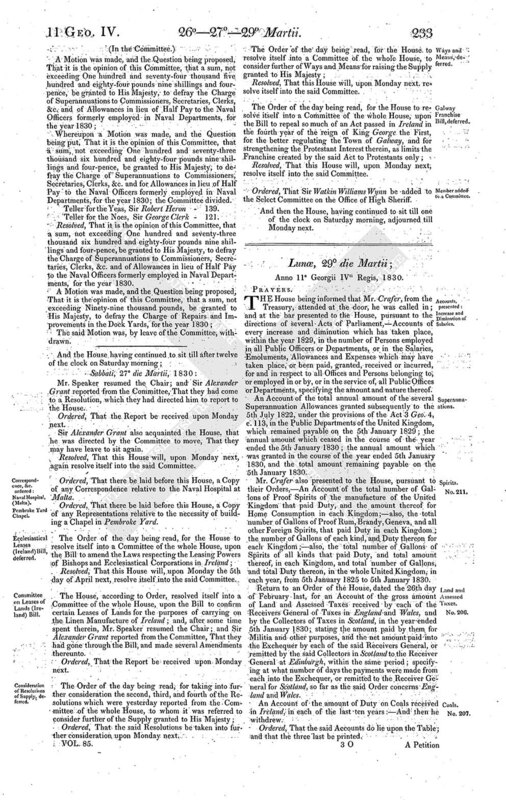 A Petition of Inhabitants of Manchester and the neighbourhood, was also presented, and read; praying, That they may be heard by counsel at the bar of the House, against the passing of any further Act for throwing open the Trade in Beer, and that the House will be pleased to repeal the Act of the 5th Geo. 4, c. 54, which has already passed with that view. A Petition of Licensed Victuallers in Frome Selwood, in the county of Somerset, and its vicinity, was presented, and read; setting forth, That the Petitioners are much gratified in observing the wisdom of the Legislature in removing the Beer Duty, but at the same time are firmly convinced, if the Duty on the stocks on hand in October is not taken off, it will be a most grievous hardship and an act of injustice, which they trust the House will duly appreciate, as the Petitioners, in that town and neighbourhood, are for the most part holders of large stocks, from 400 to 600 hogsheads, and cannot reasonably calculate on any considerable reduction between this and October, in consequence of the extreme badness of trade and the great quantity of cider, the Duty on which, the Petitioners understand, will cease in July; the Petitioners could not exhaust their stocks in less than twelve or eighteen months, consequently the brewing trade must, unless the relief above mentioned be obtained, be in a state of complete stagnation; and praying the House to adopt such measures as may enable the Victuallers in that town and neighbourhood to pursue their business without interruption or injury by the removal of that Duty, which will be for a long time a barrier to their trade. Ordered, That Mr. Charles Dundas have leave of absence for a month, on account of ill health. Ordered, That the Account of the number of Brewers, Retail Brewers, and Licensed Victuallers, in England, Scotland and Wales, which was presented to the House upon the 24th day of March, in the last Session of Parliament, be printed. A Petition of the Governors and Guardians of the Hospital for the maintenance and education of exposed and deserted young children, commonly called The Foundling Hospital;-and, of the Commissioners for paving, cleansing, lighting, watching, watering and otherwise improving and keeping in repair the streets, squares and other public passages and places which are and shall be made upon certain pieces of ground in the parishes of Saint Pancras, Saint George-the-Martyr and Saint George, Bloomsbury, or some or one of them, in the county of Middlesex, belonging to the Hospital for the maintenance and education of exposed and deserted young children, commonly called The Foundling Hospital,-were presented, and read; taking notice of the Bill to make provision for the lighting, watching, cleansing and paving of Parishes in England and Wales; and praying, That they may be heard by their counsel or agents against certain parts thereof. Ordered, That the Copy of the Report on the State of the County Hospitals and Infirmaries in Ireland, which was presented to the House upon the 27th day of February last, be referred to the Select Committee on Irish Poor. A Petition of Ship-owners of Sunderland, in the county of Durham, was presented, and read; setting forth, That the Petitioners are impelled, by the serious difficulties under which they have been long labouring, in consequence of the reduction of freights, again to call the attention of the House to their situation, in the hope that some relief may be afforded them; that the Petitioners are fully impressed with the conviction, that their distress is mainly to be attributed to the late change in the Navigation Laws of this country, which, by forcing their ships into a ruinous competition with the untaxed foreigner, will, as sad experience has now, it is presumed, sufficiently shown, soon effect the total ruin of the trade; and praying, That the House will be pleased to take their case into serious consideration, and speedily adopt measures for their relief. 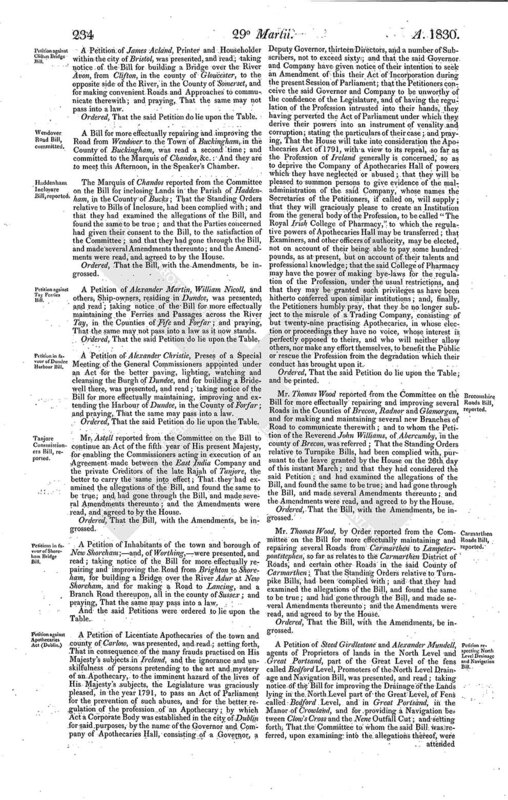 A Petition of the Churchwardens and Overseers of the Poor, and Select Vestry for the parish of Sunderland-nearthe-Sea, in the county palatine of Durham, was presented, and read; setting forth, That the Petitioners have been long impressed with an idea of the beneficial effects that would result not only to the parish of Sunderland, but to all large towns in the Kingdom, from a legislative enactment, rendering the owners of dwelling-houses under the annual rent of 25l. liable to be assessed to the poor-rate in respect of such houses, and investing the parish officers and select vestry with power to excuse or compound with such landlords in respect of such rate, in cases where the poverty of the tenants, or other circumstances, might make it necessary, and giving the right of appeal by the landlord to two Magistrates, in case the decision of such parish officers and select vestry should be considered improper, and also authorizing the rate upon such owners when liable to be enforced by distress upon their private property wheresoever situated; and praying the House to take the obstacles to a fair and proper assessment and levying of the poor-rate into their consideration, and to adopt such measures respecting the same as to the House may seem expedient. A Petition of Inhabitants of the city of Exeter and neighbourhood;-and, of Clergy, Gentry, and other Inhabitants of the parish of Madeley, in the county of Salop,-were presented, and read; praying, That in any revision or alteration of the penal laws which may be in contemplation, sanguinary punishments may be discontinued, and particularly that in case of forgery, death may not be inflicted. 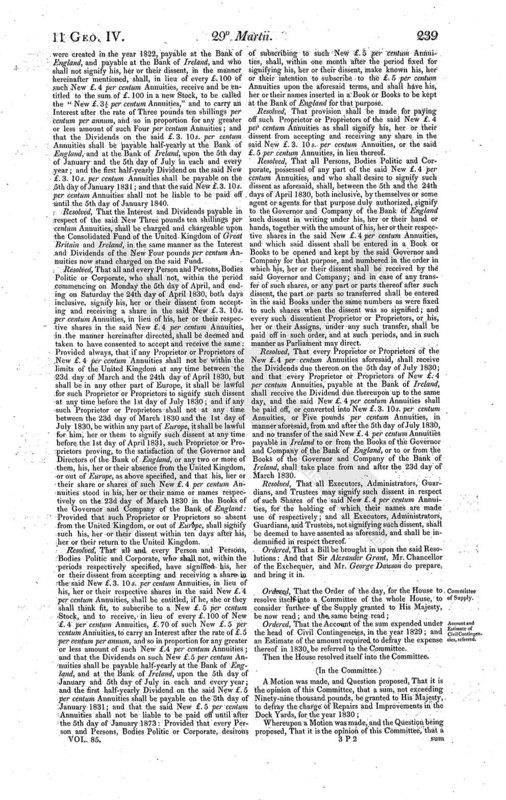 A Petition of Edward Rice, Esquire, Sheriff, Chairman of a meeting of Freeholders of the county of Kent, in County Meeting assembled, was presented, and read; praying, That the House will be pleased to institute an immediate inquiry with respect to the causes of the present distress, and to the measures which might be adopted with the view of granting speedy and effectual relief. 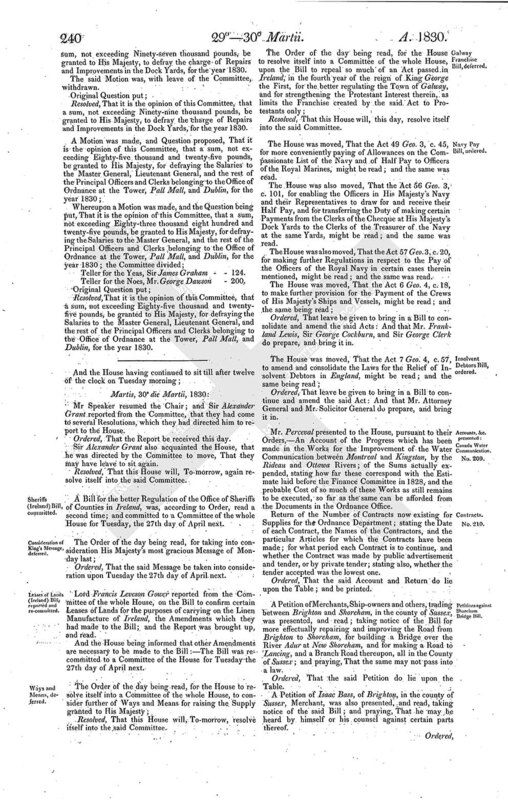 A Petition of Proprietors and Occupiers of land in the county of Wilts, was presented, and read; praying, That the House will see the expediency of extending to Ireland the same system of Poor Laws which exists in England, and thus place the agriculturists of both Kingdoms on an equal footing with respect to the public burthens, so as to enable them to compete fairly in the common market. Two Petitions of Proprietors and Occupiers of land in the county of Wilts, were also presented, and read; containing the same allegations and prayer as the preceding Petition. And the said Petitions were ordered to be referred to the Select Committee on Irish Poor. Sir George Clerk presented to the House, pursuant to their Orders,-Copy of any Correspondence relative to the Naval Hospital at Malta. Copy of any Representations relative to the necessity of building a Chapel in Pembroke Yard. The Lords have passed a Bill, intituled, An Act to render valid Marriages solemnized in certain Churches and Chapels; to which the Lords desire the concurrence of this House:-And then the Messengers withdrew. Ordered, That the Copy of a Letter from J. C. Herries, Esq. to R. W. Horton, Esq. relative to the Revenues and Expenditure of Ceylon, the Mauritius, the Cape of Good Hope, Trinidad, and Malta, and laid before the House by the Finance Committee of 1828, on the 24th June 1829, be printed. Mr. William Peel presented to the House, pursuant to their Address to His Majesty,-A Return of all Probates of Wills and Letters of Administration issued in such parts of the respective dioceses of Saint David, Saint Asaph, Llandaff and Bangor, as lie within the Principality of Wales; and specifying the amount of Assets respectively sworn on the same for the last five years. Mr. William Peel also presented to the House, pursuant to the directions of an Act of Parliament,-Returns of the number of Persons committed, tried and convicted for Criminal Offences and Misdemeanors made by the Clerks of the Peace of the several counties in England and Wales, for the year 1829, so far as the same have been received by the Secretary of State for the Home Department. Returns of the number of Persons committed for Criminal Offences and Misdemeanors made by the Clerks of Assize, Clerks of the Crown and Clerks of the Session of Oyer and Terminer and Gaol Delivery, for the year 1829, so far as the same have been received by the Secretary of State for the Home Department. Returns of the number of Persons committed, tried and convicted for Criminal Offences and Misdemeanors, made by the Clerks of the Peace for the several Counties in England and Wales for the year 1829, so far as the same have been received by the Secretary of State for the Home Department. Resolved, That an humble Address be presented to His Majesty, that He will be graciously pleased to give directions, that there be laid before this House, Summary Statements of the number of Persons charged with Criminal Offences who were committed to the different Gaols in England and Wales for trial at the Assizes and Sessions held for the several Counties, Cities, Towns and Liberties therein, during the last seven years; distinguishing the Number in each year, and showing the nature of the Crimes respectively of which they were convicted, acquitted, and with which those were charged against whom no Bills were found, and who were not prosecuted; also, the sentences of those convicted, and the number executed who received sentence of Death. Resolved, That an humble Address be presented to His Majesty, that He will be graciously pleased to give directions, that there be laid before this House, Copies or Extracts of any Instructions sent to the Governor or Legal Authorities at Newfoundland, relative to the operation of the Acts of 5 Geo. 4, c. 51, and 5 Geo. 4, c. 67, and the Answers received, if any. Ordered, That there be laid before this House, an Account of the quantities of Hemp and Flax dressed and undressed, Hemp Tow, Flax Tow, and Linen Yarns, imported into Great Britain and Ireland from Foreign parts, in the year ended 5th January 1830; distinguishing the Ports of importation and the Countries whence imported, together with the real and official values thereof. Ordered, That there be laid before this House, an Account of the quantities and official value of Hemp, Flax, and Linen Yarn, exported from Great Britain and Ireland respectively, to Foreign Countries, in the year ended 5th January 1830; distinguishing British, Irish, and Foreign produce, and the Countries to which exported. Ordered, That there be laid before this House, an Account of the quantities and official value of Irish Hemp, Flax, Flax Tow; and Linen Yarns, imported into Great Britain, in the year ended 5th January 1830. Ordered, That there be laid before this House, an Account of the quantities and official value of Hemp, Flax and Linen Yarn, exported from Great Britain to Ireland, in the year ended 5th January 1830. Ordered, That there be laid before this House, an Account of the values, real and official, and the number of yards of British and Irish Linen Cloth exported to Foreign parts from England, Scotland and Ireland respectively, in the year ended 5th January 1830; distinguishing the Countries to which the exportations were made, together with the aggregate number of yards of British and Irish Linens, upon which Bounty was paid in England, Scotland and Ireland respectively, and the amount of Bounty paid thereon in the same year. Ordered, That there be laid before this House, an Account of the values, real and official, and the number of yards of Irish Linen exported from Ireland to England and Scotland respectively, in the year ended 5th January 1830. Ordered, That there be laid before this House, an Account of the values, real and official, and the number of yards of British Linen exported from Great Britain to Ireland, in the year ended 5th January 1830. Ordered, That there be laid before this House, an Account of the quantity of Foreign and Irish Linen retained for Home Consumption in Great Britain, in the year ended 5th January 1830. Ordered, That there be laid before this House, an Account of all Foreign Linens imported and exported into and from Great Britain and Ireland respectively; distinguishing the Countries from which imported, and to which exported, in the year ended 5th January 1830; together with the amount of Duty paid upon the transit. Ordered, That there be laid before this House, an Account of the quantity of Linen Cloth of all sorts, exported from Great Britain to Ireland, and to Foreign Countries, in the year ended 5th January 1830; distinguishing British, Irish and Foreign Linens. Ordered, That there be laid before this House, an Account of the quantity of Linen Cloth of all sorts, exported from Ireland to Great Britain, and Foreign Countries, in the year ended 5th January 1830; distinguishing British, Irish, and Foreign Linens; and a similar account of the Values of Irish Linens exported to Foreign Coun tries from Great Britain, so as to show the value of Irish Linen retained in Great Britain for Home Consumption. Ordered, That there be laid before this House, an Account of the amount of Bounty paid, in the year ended 5th January 1830, an British and Irish manufactured Linens respectively, exported from Great Britain and Ireland; distinguishing the amount paid in each Country, and showing the number of yards which received the several Bounties of one halfpenny, one penny, or one penny halfpenny. Ordered, That there be laid before this House, an Account, showing the gross amount of Duties, the Drawbacks paid, and the net produce of the Duties on Foreign Linens imported into and exported from Great Britain, in the year ended 5th January 1830. Ordered, That there be laid before this House, an Account of the number of yards, the real and official value, of Irish Linens exported from Great Britain and Ireland respectively, in the year ended 5th January 1830, upon which no Bounty was claimed. Ordered, That there be laid before this House, an Account of the number of yards of Linen Cloth on which Duties of Excise have been paid, in the year ended 5th January 1830, for painting and printing Linen Cloth respectively, with the Rates of Duty paid per square yard; and a similar Account for Cotton and Silk Cloth, each description of Cloth, and the rate of Duty being distinguished. Ordered, That there be laid before this House, an Account of the number of Vessels laden with Coals which have cleared the Custom House at Stockton-upon-Tees in the year 1829. 2. Resolved, That a sum, not exceeding Fifty-two thousand two hundred and sixteen pounds five shillings and one penny, be granted to His Majesty, to defray the Salaries of the Officers, and the Contingent Expenses of the Admiralty Office, for the year 1830. 3. Resolved, That a sum, not exceeding Thirty-two thousand and thirty-three pounds one shilling and sixpence, be granted to His Majesty, to defray the Salaries of the Officers, and the Contingent Expenses of the Navy Pay Office, for the year 1830. 4. Resolved, That a sum, not exceeding Six hundred and three thousand and two hundred pounds, be granted to His Majesty, for Victuals for the said Twenty-nine thousand Men, at the rate of One pound twelve shillings per man per month. Resolved, That a sum, not exceeding Fifty-seven thousand five hundred and sixty pounds and fifteen shillings, be granted to His Majesty, to defray the Salaries of the Officers, and the Contingent Expenses of the Navy Office, for the year 1830. Resolved, That a sum, not exceeding Thirty-eight thousand two hundred and seven pounds and ten shillings, be granted to His Majesty, to defray the Salaries of the Officers, and the Contingent Expenses of the Victualling Office, for the year 1830. Resolved, That a sum, not exceeding One hundred and thirty-seven thousand four hundred and sixty pounds ten shillings and eight-pence, be granted to His Majesty, to defray the Salaries of the Officers, and the Contingent Expenses of His Majesty's Yards at Home, for the year 1830. Resolved, That a sum, not exceeding Four hundred and fifty-eight thousand seven hundred and twenty pounds, be granted to His Majesty, to pay the Wages of Artificers and Labourers employed in His Majesty's Yards at Home, for the year 1830. Resolved, That a sum, not exceeding Six hundred and eighty thousand pounds, be granted to His Majesty, to defray the charges for Timber, and other materials, for the year 1830. Resolved, That a sum, not exceeding Seventy-five thousand pounds, be granted to His Majesty, to defray the charge for Pilotage, and other Contingencies, for the year 1830. Resolved, That a sum, not exceeding Sixty-six thousand four hundred and ninety-four pounds fifteen shillings and three-pence, be granted to His Majesty, to defray the Salaries of the Officers and the Contingent Expenses of the Foreign Yards, for the year 1830. Resolved, That a sum, not exceeding Sixty-one thousand and thirty-eight pounds and five shillings, be granted to His Majesty, to defray the Salaries of the Officers and the Contingent Expenses of the Victualling Yards, for the year 1830. Resolved, That a sum, not exceeding Sixty-four thousand and twenty-six pounds seven shillings and six-pence, be granted to His Majesty, to defray the Salaries of the Officers, and the Contingent Expenses of the Naval Medical Establishments, for the year 1830. Resolved, That a sum, not exceeding Eight hundred and forty-five pounds eight shillings and three-pence, be granted to His Majesty, to defray the Salaries of the Officers and the Contingent Expenses of the Royal Naval College and School for Naval Architecture, for the year 1830. Resolved, That a sum, not exceeding One hundred and five thousand eight hundred and thirty-four pounds and four-pence, be granted to His Majesty, to pay the Wages, Allowances and Victuals of Officers and Men of Vessels in Ordinary, for the year 1830. Resolved, That a sum, not exceeding Twenty-seven thousand eight hundred and seventy pounds, be granted to His Majesty, to defray the Expenses of the hire of Packets, for the year 1830. Resolved, That a sum, not exceeding Eight hundred and fifty-four thousand pounds, be granted to His Majesty, to defray the Charge of Half Pay to Naval Officers, for the year 1830. Resolved, That a sum, not exceeding Two hundred and ninety-six thousand and sixty-three pounds seventeen shillings and nine-pence, be granted to His Majesty, for Superannuations, Pensions and Allowances to Naval Officers, their Widows and Relatives, for the year 1830. Resolved, That a sum, not exceeding One thousand and five hundred pounds, be granted to His Majesty, to defray the Charge for Bounty to Chaplains, for the year 1830. Resolved, That a sum, not exceeding Two hundred and seventy thousand pounds, be granted to His Majesty, towards the payment of Out-Pensioners of Greenwich Hospital, for the year 1830. Resolved, That a sum, not exceeding One hundred and seventy-three thousand six hundred and eighty-four pounds nine shillings and four-pence, be granted to His Majesty, to defray the Charge of Superannuations to Commissioners, Secretaries, Clerks, &c. and of Allowances in lieu of Half Pay to the Naval Officers formerly employed in Naval Departments, for the year 1830. Resolved, That all and every Person and Persons, Bodies Politic and Corporate, who now is or are, or hereafter may be, interested in, or entitled unto, any part of the National Debt redeemable by Law, which now carries an Interest after the rate of £.4 per centum per annum, and is usually known by the name of "New £.4 per Cents," and which were created in the year 1822, payable at the Bank of England, and payable at the Bank of Ireland, and who shall not signify his, her or their dissent, in the manner hereinafter mentioned, shall, in lieu of every £.100 of such New £.4 per centum Annuities, receive and be entitled to the sum of £.100 in a new Stock, to be called the "New £.3½ per centum Annuities," and to carry an Interest after the rate of Three pounds ten shillings per centum per annum, and so in proportion for any greater or less amount of such Four per centum Annuities; and that the Dividends on the said £.3. 10s. per centum Annuities shall be payable half-yearly at the Bank of England, and at the Bank of Ireland, upon the 5th day of January and the 5th day of July in each and every year; and the first half-yearly Dividend on the said New £.3. 10s. per centum Annuities shall be payable on the 5th day of January 1831; and that the said New £.3. 10s. per centum Annuities shall not be liable to be paid off until the 5th day of January 1840. Resolved, That the Interest and Dividends payable in respect of the said New Three pounds ten shillings per centum Annuities, shall be charged and chargeable upon the Consolidated Fund of the United Kingdom of Great Britain and Ireland, in the same manner as the Interest and Dividends of the New Four pounds per centum Annuities now stand charged on the said Fund. Resolved, That all and every Person and Persons, Bodies Politic or Corporate, who shall not, within the period commencing on Monday the 5th day of April, and ending on Saturday the 24th day of April 1830, both days inclusive, signify his, her or their dissent from accepting and receiving a share in the said New £.3. 10s. per centum Annuities, in lieu of his, her or their respective shares in the said New £.4 per centum Annuities, in the manner hereinafter directed, shall be deemed and taken to have consented to accept and receive the same: Provided always, that if any Proprietor or Proprietors of New £.4 per centum Annuities shall not be within the limits of the United Kingdom at any time between the 23rd day of March and the 24th day of April 1830, but shall be in any other part of Europe, it shall be lawful for such Proprietor or Proprietors to signify such dissent at any time before the 1st day of July 1830; and if any such Proprietor or Proprietors shall not at any time between the 23rd day of March 1830 and the 1st day of July 1830, be within any part of Europe, it shall be lawful for him, her or them to signify such dissent at any time before the 1st day of April 1831, such Proprietor or Proprietors proving, to the satisfaction of the Governor and Directors of the Bank of England, or any two or more of them, his, her or their absence from the United Kingdom, or out of Europe, as above specified, and that his, her or their share or shares of such New £.4 per centum Annuities stood in his, her or their name or names respectively on the 23rd day of March 1830 in the Books of the Governor and Company of the Bank of England: Provided that such Proprietor or Proprietors so absent from the United Kingdom, or out of Europe, shall signify such his, her or their dissent within ten days after his, her or their return to the United Kingdom. Resolved, That all and every Person and Persons, Bodies Politic and Corporate, who shall not, within the periods respectively specified, have signified his, her or their dissent from accepting and receiving a share in the said New £.3. 10s. per centum Annuities, in lieu of his, her or their respective shares in the said New £.4 per centum Annuities, shall be entitled, if he, she or they shall think fit, to subscribe to a New £5 per centum Stock, and to receive, in lieu of every £.100 of New £.4 per centum Annuities, £.70 of such New £.5 per centum Annuities, to carry an Interest after the rate of £.5 per centum per annum, and so in proportion for any greater or less amount of such New £.4 per centum Annuities; and that the Dividends on such New £.5 per centum Annuities shall be payable half-yearly at the Bank of England, and at the Bank of Ireland, upon the 5th day of January and 5th day of July in each and every year; and the first half-yearly Dividend on the said New £.5 per centum Annuities shall be payable on the 5th day of January 1831; and that the said New £.5 per centum Annuties shall not be liable to be paid off until after the 5th day of January 1873: Provided that every Person and Persons, Bodies Politic or Corporate, desirous of subscribing to such New £.5 per centum Annuities, shall, within one month after the period fixed for signifying his, her or their dissent, make known his, her or their intention to subscribe to the £.5 per centum Annuities upon the aforesaid terms, and shall have his, her or their names inserted in a Book or Books to be kept at the Bank of England for that purpose. Resolved, That provision shall be made for paying off such Proprietor or Proprietors of the said New £.4 per centum Annuities as shall signify his, her or their dissent from accepting and receiving any share, in the said New £.3. 10s. per centum Annuities, or the said £.5 per centum Annuities, in lieu thereof. Resolved, That all Persons, Bodies Politic and Corporate, possessed of any part of the said New £.4 per centum Annuities, and who shall desire to signify such dissent as aforesaid, shall, between the 5th and the 24th days of April 1830, both inclusive, by themselves or some agent or agents for that purpose duly authorized, signify to the Governor and Company of the Bank of England such dissent in writing under his, her or their hand or hands, together with the amount of his, her or their respective shares in the said New £4 per centum Annuities, and which said dissent shall be entered in a Book or Books to be opened and kept by the said Governor and Company for that purpose, and numbered in the order in which his, her or their dissent shall be received by the said Governor and Company; and in case of any transfer of such shares, or any part or parts thereof after such dissent, the part or parts so transferred shall be entered in the said Books under the same numbers as were fixed to such shares when the dissent was so signified; and every such dissentient Proprietor or Proprietors, or his, her or their Assigns, under any such transfer, shall be paid off in such order, and at such periods, and in such manner as Parliament may direct. Resolved, That every Proprietor or Proprietors of the New £.4 per centum Annuities aforesaid, shall receive the Dividends due thereon on the 5th day of July 1830; and that every Proprietor or Proprietors of New £.4 per centum Annuities, payable at the Bank of Ireland, shall receive the Dividend due thereupon up to the same day, and the said New £.4 per centum Annuities shall be paid off, or converted into New £.3. 10s. per centum Annuities, or Five pounds per centum Annuities, in manner aforesaid, from and after the 5th day of July 1830, and no transfer of the said New £.4 per centum Annuities payable in Ireland to or from the Books of the Governor and Company of the Bank of England, or to or from the Books of the Governor and Company of the Bank of Ireland, shall take place from and after the 23d day of March 1830. Resolved, That all Executors, Administrators, Guardians, and Trustees may signify such dissent in respect of such Shares of the said New £.4 per centum Annuities, for the holding of which their names are made use of respectively; and all Executors, Administrators, Guardians, and Trustees, not signifying such dissent, shall be deemed to have assented as aforesaid, and shall be indemnified in respect thereof. Ordered, That a Bill be brought in upon the said Resolutions: And that Sir Alexander Grant, Mr. Chancellor of the Exchequer, and Mr. George Dawson do prepare, and bring it in. Ordered, That the Account of the sum expended under the head of Civil Contingencies, in the year 1829; and an Estimate of the amount required to defray the expense thereof in 1830, be referred to the Committee. Whereupon a Motion was made, and the Question being proposed, That it is the opinion of this Committee, that a sum, not exceeding Ninety-seven thousand pounds, be granted to His Majesty, to defray the charge of Repairs and Improvements in the Dock Yards, for the year 1830. Resolved, That it is the opinion of this Committee, that a sum, not exceeding Ninety-nine thousand pounds, be granted to His Majesty, to defray the charge of Repairs and Improvements in the Dock Yards, for the year 1830. Teller for the Yeas, Sir James Graham - 124. Teller for the Noes, Mr. George Dawson - 200. 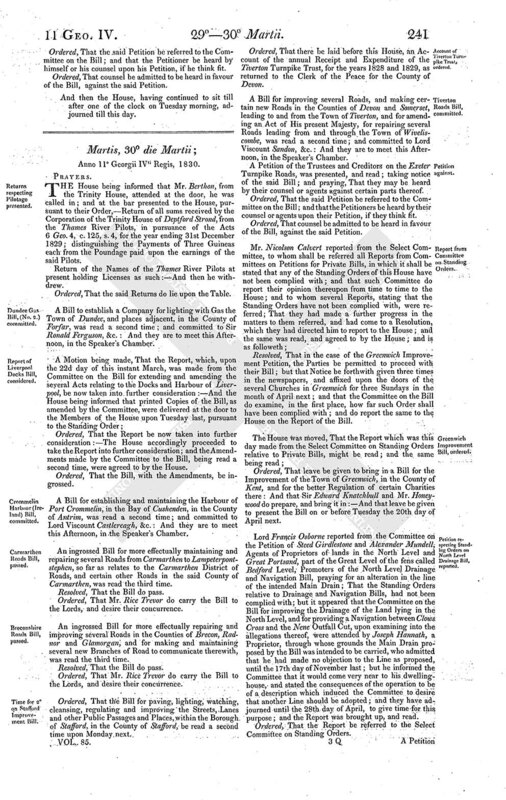 Resolved, That it is the opinion of this Committee, that a sum, not exceeding Eighty-five thousand and twentyfive pounds, be granted to His Majesty, for defraying the Salaries to the Master General, Lieutenant General, and the rest of the Principal Officers and Clerks belonging to the Office of Ordnance at the Tower, Pall Mall, and Dublin, for the year 1830. Mr. Speaker resumed the Chair; and Sir Alexander Grant reported from the Committee, that they had come to several Resolutions, which they had directed him to report to the House. Resolved, That this House will, To-morrow, again resolve itself into the said Committee. A Bill for the better Regulation of the Office of Sheriffs of Counties in Ireland, was, according to Order, read a second time; and committed to a Committee of the whole House for Tuesday, the 27th day of April next. Ordered, That the said Message be taken into consideration upon Tuesday the 27th day of April next. Lord Francis Leveson Gower reported from the Committee of the whole House, on the Bill to confirm certain Leases of Lands for the purposes of carrying on the Linen Manufacture of Ireland, the Amendments which they had made to the Bill; and the Report was brought up, and read. And the House being informed that other Amendments are necessary to be made to the Bill:-The Bill was recommitted to a Committee of the House for Tuesday the 27th day of April next. The House was moved, That the Act 49 Geo. 3, c. 45, for more conveniently paying of Allowances on the Compassionate List of the Navy and of Half Pay to Officers of the Royal Marines, might be read; and the same was read. The House was also moved, That the Act 56 Geo. 3, c. 101, for enabling the Officers in His Majesty's Navy and their Representatives to draw for and receive their Half Pay, and for transferring the Duty of making certain Payments from the Clerks of the Checque at His Majesty's Dock Yards to the Clerks of the Treasurer of the Navy at the same Yards, might be read; and the same was read. The House was also moved, That the Act 57 Geo. 3, c. 20, for making further Regulations in respect to the Pay of the Officers of the Royal Navy in certain cases therein mentioned, might be read; and the same was read. Ordered, That leave be given to bring in a Bill to consolidate and amend the said Acts: And that Mr. Frankland Lewis, Sir George Cockburn, and Sir George Clerk do prepare, and bring it in. Ordered, That leave be given to bring in a Bill to continue and amend the said Act: And that Mr. Attorney General and Mr. Solicitor General do prepare, and bring it in. Mr. Perceval presented to the House, pursuant to their Orders,-An Account of the Progress which has been made in the Works for the Improvement of the Water Communication between Montreal and Kingston, by the Rideau and Ottawa Rivers; of the Sums actually expended, stating how far these correspond with the Estimate laid before the Finance Committee in 1828, and the probable Cost of so much of these Works as still remains to be executed, so far as the same can be afforded from the Documents in the Ordnance Office. Return of the Number of Contracts now existing for Supplies for the Ordnance Department; stating the Date of each Contract, the Names of the Contractors, and the particular Articles for which the Contracts have been made; for what period each Contract is to continue, and whether the Contract was made by public advertisement and tender, or by private tender; stating also, whether the tender accepted was the lowest one. Ordered, That the said Account and Return do lie upon the Table; and be printed. A Petition of Merchants, Ship-owners and others, trading between Brighton and Shoreham, in the county of Sussex, was presented, and read; taking notice of the Bill for more effectually repairing and improving the Road from Brighton to Shoreham, for building a Bridge over the River Adur at New Shoreham, and for making a Road to Lancing, and a Branch Road thereupon, all in the County of Sussex; and praying, That the same may not pass into a law. A Petition of Isaac Bass, of Brighton, in the county of Sussex, Merchant, was also presented, and read, taking notice of the said Bill; and praying, That he may be heard by himself or his counsel against certain parts thereof. Ordered, That the said Petition be referred to the Committee on the Bill; and that the Petitioner be heard by himself or his counsel upon his Petition, if he think fit. And then the House, having continued to sit till after one of the clock on Tuesday morning, adjourned till this day.